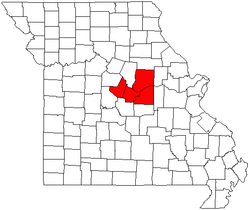 The Jefferson City Metropolitan Statistical Area, as defined by the United States Census Bureau, is an area consisting of four counties – Cole, Callaway, Moniteau, and Osage – in central Missouri anchored by the city of Jefferson City. As of the 2010 census, the MSA had a population of 149,807. The Columbia metropolitan area also consists of four counties, and borders the Jefferson City MSA to the north. ^ "Table 1. Annual Estimates of the Population of Metropolitan and Micropolitan Statistical Areas: April 1, 2000 to July 1, 2009 (CBSA-EST2009-01)". 2009 Population Estimates. United States Census Bureau, Population Division. 2010-03-23. Archived from the original (CSV) on March 26, 2010. Retrieved 2010-03-25.